Alright, y’all. I’ve been slacking. I have had this recipe stored away and have been meaning to share it for quite some time. But I’ve suffered from a bit of blogging ADD (Oh look, pumpkin!) and got distracted by all of the fall things. 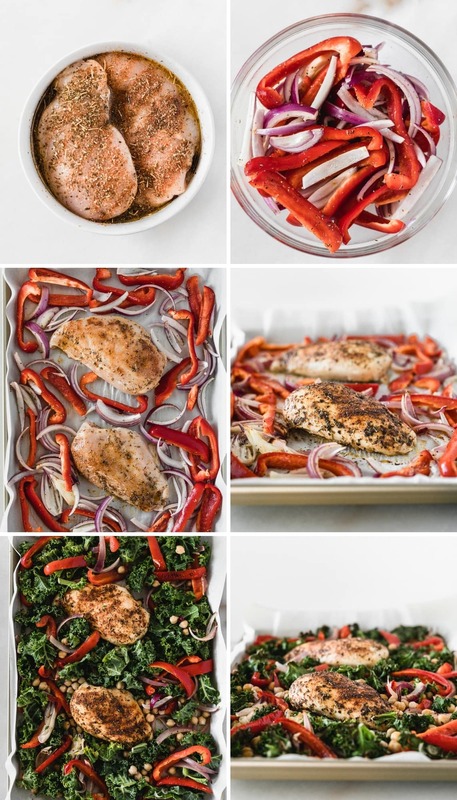 But I’m back with a healthy sheet pan chicken dinner recipe perfect for weeknights or meal prep – healthy Greek chicken bowls! These delicious, healthy Greek chicken bowls are like a whole Mediterranean meal in a bowl, because everything tastes better in a bowl, right? It’s science. Healthy Greek chicken bowls have all of the delicious Greek flavors you love, and they’re super easy to make! I roast the veggies and the chickpeas all on the same sheet pan while the quinoa cooks, and whip up a little tzatziki sauce after cutting up the cucumber and tomato. The Greek chicken can either be grilled or cooked on the sheet pan with the veggies. Once everything is done cooking, all you have to do is scoop it up into a bowl and dig in! These delicious Greek bowls are also great to make for a crowd because each person can customize theirs to suit their tastes. All of the ingredients are nut free, and gluten free, so they’re suitable for lots of diets, and the meat can be left off for a vegetarian meal that’s still full of fiber and plant-based protein from all of the veggies, quinoa, and chickpeas. 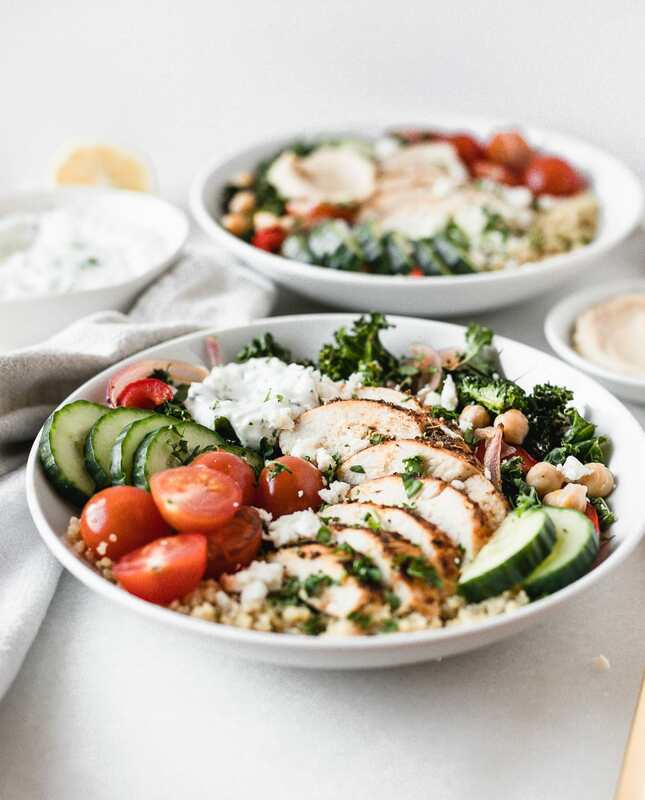 To make these healthy Greek chicken bowls even easier to make, you can meal prep, cooking the quinoa, chicken, and veggies and prepping the tzatziki sauce ahead of time so that they’re super easy to throw together when you’re ready to eat. Meanwhile, prepare Greek chicken to cook. Toss bell pepper and onion slices with olive oil, oregano, salt and pepper. Place chicken on a sheet pan lined with parchment or a silicone baking mat. Spread veggies on the sheet pan in a single layer. Roast for 15-20 minutes, stirring veggies halfway through. When veggies and chicken have about 10 minutes remaining, add chickpeas to the baking mat to warm. While chicken and veggies are cooking, prepare tzatziki sauce and cut tomatoes and cucumbers. Assemble bowls. 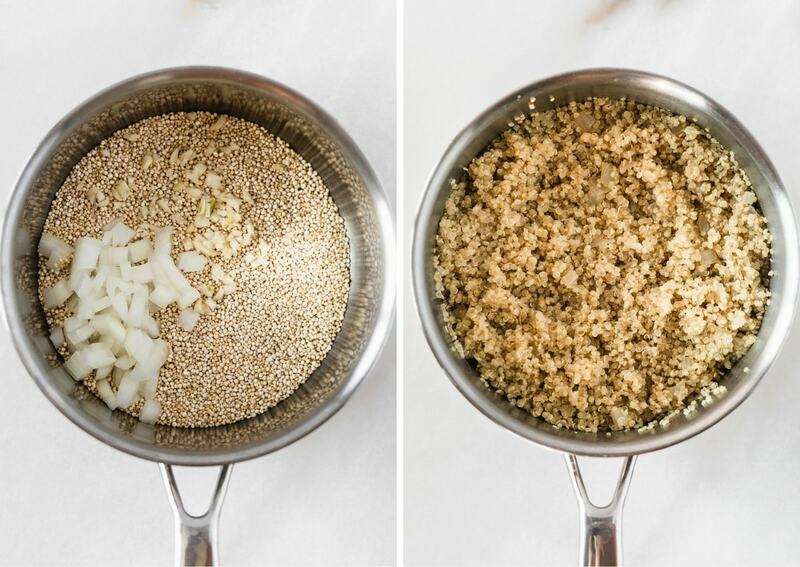 Divide cooked quinoa and baby spinach between bowls. Top each with roasted veggies and chickpeas, sliced chicken, cucumber, tomato, and tzatziki. Add hummus, herbs and olives, if using, and serve. Looks super satisfying and yet super nutritious! Nice! Dreamy power bowl. You had me at “Greek.” And I hear you about blogging ADD. The struggle is real. Thanks Sonali! I’m obsessed with Greek too! Mmmm love the flavors in this bowl! You can never go wrong with Greek 😉 Can’t wait to try! Thank you so much, Lauren! You’re the sweetest! You had me at “Greek”!!! 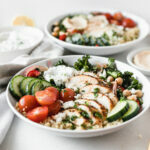 I’m a sucker for any type of Greek cuisine, so your power bowl looks absolutely PERFECT to me. Yum!! This looks amazing! Do you think these could be assembled for a couple days in advance and just leave the toppings off until ready to serve? I love to make things ahead of time so I can just grab them from the fridge when i have a crazy day! This recipe is AMAZING. Truly one of my favorite new recipes in a very long time. I can’t believe how good this is for being so dang healthy. Thank you!!! So glad you enjoyed the recipe, Diane!